Where are the two judgments in the Bible? 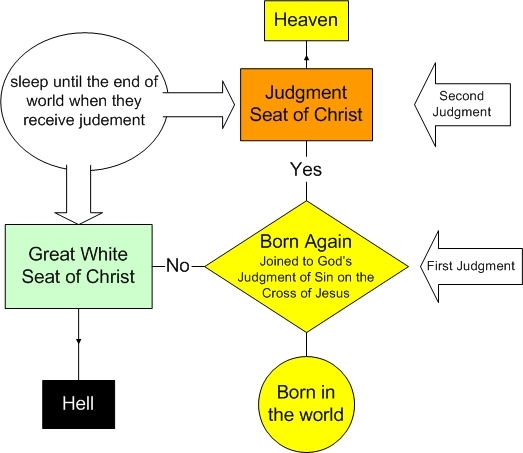 For those Evangelicals who understand their teachings about the "Great White Seat of Christ", the "judgment Seat of Christ" and God's judgment of sin at the Cross, this could be helpful. Some Evangelicals are nervous about asking Christians in heaven to pray for us because they think the final judgment hasn't occurred yet and therefore not in heaven. The Evangelist, Calvin held that the final destiny is not decided until the last day of history. (Inst. III, 25) This is the view of most Evangelicals. The judgment Seat of Christ is an evaluation of a Christian's production during his Christian life on earth. There is no judgment of sin at the judgment Seat. Believer's sins were judged at the Cross, and Christ was our atonement for sin. Now this kind of contradicts the Calvinists noted above. So there is quite a bit of division among Evangelical denominations on this point. It appearsthat Evangelicals have taken the Catholic concept of "Particular judgment" and moved it from the time of "death" to the moment that the person surrenders to Christ (born again). At the "born again" moment they join in God's judgment of sin on the cross.that's two judgments. One at "born again" experience and another at the end of the world. So Catholics and Evangelicals are not as far away from each other as it first appears. The only difference is that Evangelicals infer that the first judgment occurs when they are born again (they are joined to God's judgment of sin on the cross), and Catholics believe the first judgment occurs at death. Both Catholics and most Evangelicals believe we will be judged at the end of the world. At every Evangelical funeral I hear people saying, "He is with the Lord now." They are confident the person is in heaven (although some would say he's in a 'coma' until the final judgment.) Nevertheless, they believe the person is in heaven. We Catholics think the faithful guy who "dies" is dancing and singing and rejoicing in heaven. The Evangelist Billy Graham said at the last crusade in Ottawa, "We don't know when the end of the world will be, but the end of the world for us is the day we die." Some Scriptures that Catholics use to support the doctrine of "Particular" judgment at the time of death are: the penitent thief was promised that his soul instantly on leaving the body would be in the state of the blessed: "This day thou shalt be with me in Paradise" (Luke 23:43). St. Paul (2 Cor 5) longs to be absent from the body that he may be present to the Lord, evidently understanding death to be the entrance into his reward (cf. Philemon 1:21 sq.). Then I saw thrones, and those seated on them were given authority to judge. I also saw the souls of those who had been beheaded for their testimony to Jesus and for the word of God. They had not worshiped the beast or its image and had not received its mark on their foreheads or their hands. They came to life and reigned with Christ a thousand years. 5 (The rest of the dead did not come to life until the thousand years were ended.) This is the first resurrection. 6 Blessed and holy are those who share in the first resurrection. Over these the second death has no power, but they will be priests of God and of Christ, and they will reign with him a thousand years. 12 And I saw the dead, great and small, standing before the throne, and books were opened. Also another book was opened, the book of life. And the dead were judged according to their works, as recorded in the books. 13 And the sea gave up the dead that were in it, Death and Hades gave up the dead that were in them, and all were judged according to what they had done. For these reasons the Catholic Church has no problem considering that faithful Christians who die are "with the Lord" in Heaven. The Church has no problem with giving some of these great Christians the title of "Canonized Saints." The Church has no problem instructing people to invite these Saints to pray for us on earth. There is a song that is a "Top 10" Christian hit by Evangelical singer Chris Rice. It says "I just want to be with you [God], I want this waiting to be over." Catholics say "Amen" to that.